Inspiration can strike at your lowest point -- like when it struck Will Smith in The Pursuit of Happyness, or like it struck you, walking out of The Pursuit of Happyness. Turning a low into a meaty high, the man behind Dallas Taco Bracket. 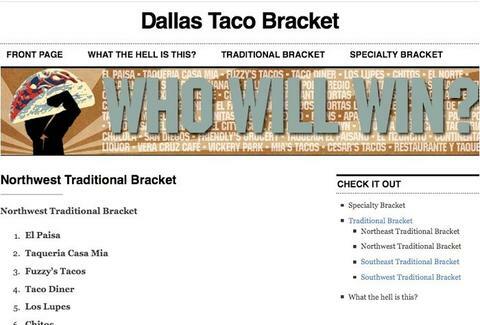 Launching full functionality today, DTB's an online, geographically broken-down elimination tourney featuring 64 of our finest taco spots -- from Aztec Tortillas to Urban Taco -- conceived by a North Dallas taco-holic even as his NCAA bracket was getting absolutely Farokh-manhandled. Initial nominations came by way of pals/pals of pals, then were vetted via social networking/foodie blog research, arranged in NE/NW/SE/SW regions, and randomly paired for the gen-public to vote on (once a day) for a week at a time; winners move on to a Sweet 16, where they'll be pitted against one another based on # of votes leading into the round, meaning Carolina's won't be battling anyplace known for its camarones-crazies 'til the Final Four (yes, that joke'd be better if the real Carolina hadn't become Seton Hall). Midway through, a bonus tourney will commence: a 24-taco "Specialty Bracket" featuring gourmet numbers like Blue Mesa's Corn-Crusted Grouper tortilla wrap against Good2Go's soyrizio/tofu vegan job, which really belongs in the vegetariaNIT. DTB also plans to organize "taco crawls" in joint-rich 'hoods via Gowalla, Foursquare, etc; if the poll's successful, its creator wants to host similar contests for burger joints and Vietnamese pho houses -- before you say 64 of those sounds like a stretch, just remember, where there's a Will, and/or a Jaden, there's a way.